Based on a recent report the UK tech sector is not likely to be affected hard by accessing foreign talent as was originally expected in the light of Brexit. It analysed the composition of Britain’s 1.7 million digital work-force, and discovered that many overseas workers, in the tech sector of the country, were citizens of non- European Union countries. They had been hired by employers, by using the Tier 2 visa system, having Tier 2 Sponsorship Licences. The truth that various IT companies of the UK were spending the time and money, besides taking the trouble to get a Tier 2 Sponsorship Licence followed by a Tier 2 Visa, proposes that a great shortage of Information Technology skills exists. UK Immigration authorities are making it difficult to obtain Tier 2 Visas. In the present scenario, it is likely that the shortage of IT skills will worsen and damage the UK tech sphere. News of Britain’s exit had increased the worries of a skill shortage in the tech industry because accessing high-skilled workers from the European Union would be in jeopardy. Out of the 13 percent who work in the technology sphere, nearly half are nationals of non-EU nations and are most likely to get a job on Tier 2 visas, based on a Nesta and Tech City UK research. The study also says that workers from non-EU areas who hold a Tier 2 Visa and are sponsored by a British employer, had high education. As per the report, 17 percent of non-EU international workers are qualified and have a PhD or Master’s degree. Comparatively, only 12 percent of EU workers had such authorization. The employing of EU nationals to do digital jobs has seen a fast pace between 2010 and 2015 compared with the employment of non-EU workers. The fact is it was because of the strict Tier 2 visa rules, followed in those five years. 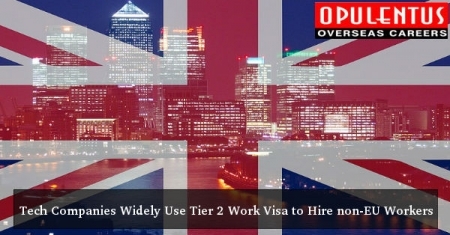 In April 2015 the increase in minimum salary threshold of Tier 2 ICT visa was announced by Home Office. This resulted in the hiring of non-EU workers, becoming more expensive for employers. Entrepreneurs have apprehensions, about the degree to which tech communities depend, on talent flow from both EU as well as non-EU countries, to manage their business. A compilation of the exact mix of nationalities here can identify where the pressure may exist in the years to come. If a candidate is interested in Immigrating to UK we are happy to offer the best guidance and tips for success.fill out a free evaluation form or contact us at [email protected] or call us 1800 103 1555. One of our experts will meet your expectations and provide answers to queries.